you are never more than about eight feet away from a spider? Spiders are fascinating creatures. They have specialized body parts and unique behaviors in the Animal Kingdom. The ISM is presenting an online collection of spiders containing facts and resources that help people learn about these wonderful and ever-present arachnids. 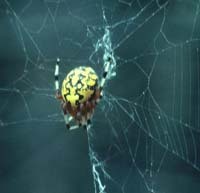 A list of print and Web resources about spiders that also contains several full-text articles from The Living Museum magazine (in PDF format) about spiders and their habits.